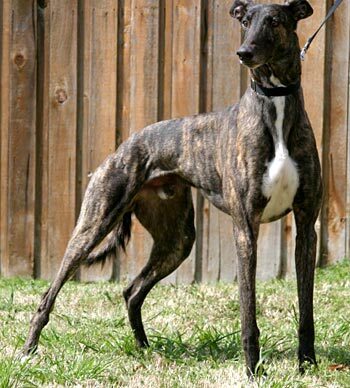 Mark, aka Remark, is a handsome, dark brindle, 2-year-old male with a striking white tuxedo chest born December 12, 2005. His sire is Kiowa Sweet Trey and his dam is Simone. Mark's racing career of 2 races started November 30, 2007, at Valley Race Park in Harlingen, TX, and finished on December 5 with a fractured right hock. Mark's leg was splinted and put in a cast, and he was taken back to his owner's farm to recuperate. He was officially retired when, after 10 weeks, his leg proved to be too unstable for racing again. X-rays were taken upon Mark's arrival into GALT, and the fracture has heavily calcified. Mark is in a foster home now and is being closely monitored. He does not show any indications of problems from the fracture regarding limping now. Mark and small animals: Mark was very interested in the cat. He was so interested that he would not back off and then proceeded to scoop Molly up in his front paws. I had never seen anything like it and Molly was NOT happy! Mark is not to be trusted with cats! But Mark lives with a Pug, so he can live with small dogs. Mark has been an absolute pleasure. I have come to adore his gentle and endearing personality. 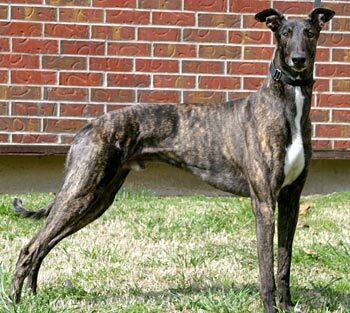 He is such a handsome boy, with a beautiful dark brindle coat and a striking white stripe down his chest. Mark is quickly learning the rules of the house and is respectful of the occasional "No, Markus." Mark is crated during the day. Although he is not excited about it, he will eventually ease in there with the help of a tasty treat! Mark walks very well on a leash, though he tends to be a little guarded in a new situation, but given some time he warms right up and shows his true colors. He is perfectly content in the evenings curled up on his favorite dog bed as he settles in for a good long nap. He will stay there for most of the evening or until you get up - then he will become your right-hand man. He loves to be around his human and will follow you from room to room, always patiently waiting to see what you will do next. Potty training is coming along rather well for this first-time home dweller. For Mark, as well as most any other dogs, it is all about a routine. If I keep up with my end of the bargain, Mark always keeps up with his. Mark lives in a home with a Pug, so we know he is tolerant of small dogs. Now we need to see how he will do with cats. 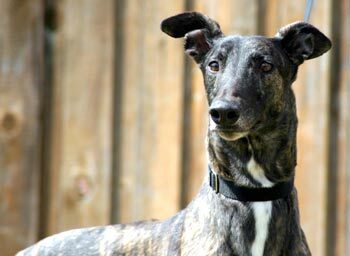 Mark will make a GREYT companion. We will be very sad to see him go, but will be excited for him to find his forever home.